Definition at line 17 of file gzip.h. Definition at line 28 of file gzip.h. filetime the filetime to set in the header. The application is responsible for setting it. Definition at line 42 of file gzip.h. filename the original filename to set in the header. The application is responsible for setting it. RFC 1952 requires a ISO/IEC 8859-1 encoding. throwOnEncodingError if throwOnEncodingError is true, then the filename is checked to ensure it is ISO/IEC 8859-1 encoded. If the filename does not adhere to ISO/IEC 8859-1, then a InvalidDataFormat is thrown. If throwOnEncodingError is false then the filename is not checked. Definition at line 89 of file gzip.cpp. comment the comment to set in the header. The application is responsible for setting it. RFC 1952 requires a ISO/IEC 8859-1 encoding. throwOnEncodingError if throwOnEncodingError is true, then the comment is checked to ensure it is ISO/IEC 8859-1 encoded. If the comment does not adhere to ISO/IEC 8859-1, then a InvalidDataFormat is thrown. If throwOnEncodingError is false then the comment is not checked. Definition at line 75 of file gzip.cpp. 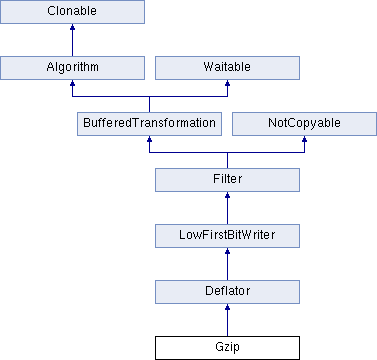 Definition at line 15 of file gzip.cpp.